We’re building on our past work on inclusion of newcomer girls and women. Our goal? To expand the body of knowledge and promising practices for actively engaging this underserved population in and through sport and physical activity. We’ve partnered with 20 community organizations across Canada and are spending the next two years learning with them. CAAWS is working with sport organizations in Ontario to identify, create and test new tools and resources that meet their needs and priorities by increasing the engagement of women and girls as athletes and leaders in their sport. Learn more about this initiative supported by Status of Women Canada and in collaboration with Ontario Soccer and Ontario Basketball. Allison Sandmeyer-Graves is proud to represent CAAWS on Minister of Science and Sport Kirsty Duncan’s Working Group on Gender Equity in Sport. This initiative gathers perspectives, experiences and insights to inform strategies to better understand and serve the specific needs of girls and women in sport. for women and girls in sport. Ontario Soccer held their first Female Only Mentorship Training Day for female Match Officials. Currently, 23% of Match Officials are female and if they reach their third-year officiating they stay in the game a lot longer. Based off 2012-2015 surveys, lack of mentorship is the #2 reason Match Officials leave the game and Ontario Soccer is focused on creating mentoring relationships with mentors that their mentees can relate to. 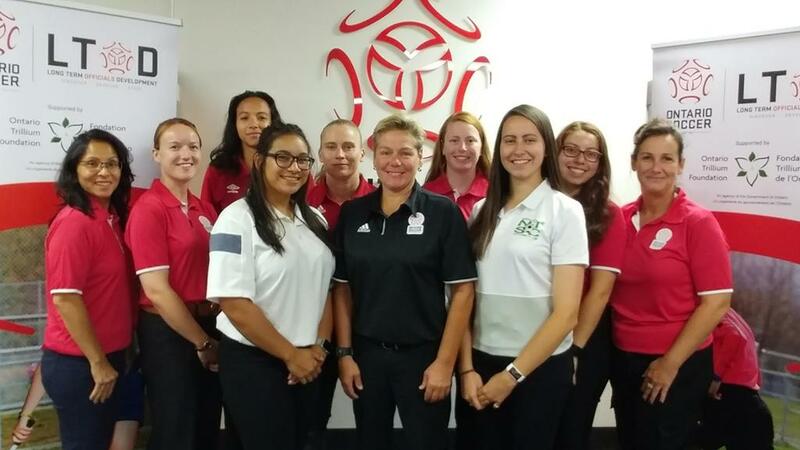 “As the only female in my role in Canada, I know the importance of a female being mentored and supported, and the importance of a female role model that I can look up to,” explains Nicky Pearson, Manager of Match Officials at Ontario Soccer. By evaluating current programs regularly, organizations can identify gaps in how they are addressing the specific needs of girls and women in their sport and find solutions to better support their success in positions of leadership. For a mentorship model that can be adapted to create successful mentoring relationships, check out the Female Coach Mentorship Model. We are excited to be kicking off our national Women on Boards webinars this September!Join the first of four esteemed presenters who will deliver CAAWS’ Women on Boards presentation, providing best practices for expanding gender equity on sport boards, while sharing their unique experiences and perspectives! The first webinar will be on September 29th from 12-1 PM ET. Save the date and check your inbox for details! You can host a dedicated presentation or webinar for your organization. This 20-minute documentary follows Candice Kay-Gibb's journey as she addresses the challenges and stigmas that still exist for women in one of the oldest sports, Olympic wrestling, featuring current and former Canadian Olympians Tonya Verbeek, Carol Huynh, Erica Wiebe, and coach Marty Calder. See how they are breaking down barriers for gender equity! Support Female Leaders in Your Organization! CAAWS’ Women and Leadership Program is a set of six professional development workshops specifically for women. These sessions help create opportunities to share experiences, reflect on ideas and apply specific techniques to their current work environment. 98% of participants surveyed would join another workshop and recommend it a colleague! Invest in the potential of female leaders by booking today! Q1. 61% of girls who play sport reported high body confidence, compared to ___% of girls who don't. Q2. ___% of girls aged 12 to 17 get the recommended amount of physical activity. Q3. If a girl doesn’t participate in sport by age 10, there’s a ___% chance she will be active as an adult. Q4. When mother's participate in sport, their children's participation jumps to 71% from ___%. Q1- State of the Nation: Teenage Girls and Sport Quantitative Report. LIDL, 2017. Q2- Statistics Canada - Directly measured physical activity of children and youth, 2012 and 2013 [2017 Update]. Q3- Women in Sport: Fuelling a Lifetime of Participation. CAAWS, 2016. Brenda Andress on her celebrated tenure as Commissioner of the CWHL, and Jayna Hefford for assuming the role on an interim basis. Mel Davidson on her retirement as the General Manager of Hockey Canada women’s team, and to Gina Kingsbury for assuming this influential leadership position. Candace Kwan for being named head coach of the Northern Lights, Canada’s national women’s Australian rules football team. Karina LeBlanc for being named head of CONCACAF Women’s Football. Colleen Jones, Nancy Garapick, Aileen Meagher (posthumously), Karen Furneaux, and Ellie Black for being honoured as members of Nova Scotia’s Top 15 athletes of all-time. Mary Moran for her appointment as CEO of the Calgary 2026 Olympic and Paralympic bid committee. Heidi El Tabakh for her new position as head coach of the Canadian Fed Cup Tennis Team.